Tuesday 2nd. December, 2014 – A Presbytery Meeting for me to remember! We visited Henderson Park in Coldstream this afternoon. 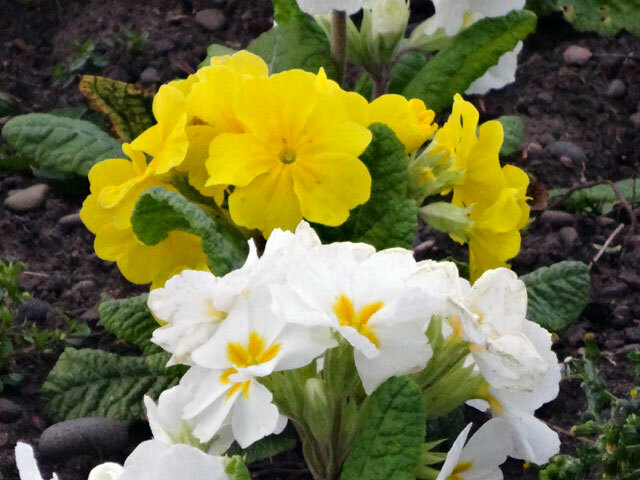 It had recently been set out with new plants – and they looked great! I was up early this morning and away from Mount Pleasant by 6.30 a.m. taking Olive to Berwick to catch a train (Mix came with me as always). We were back home by about seven-fifteen. I was across in the farmhouse to make the fire half-an-hour later and found that Cathy and Morag were already up and in the lounge, so they came with me as we walked the dogs on the road down to the bridge. 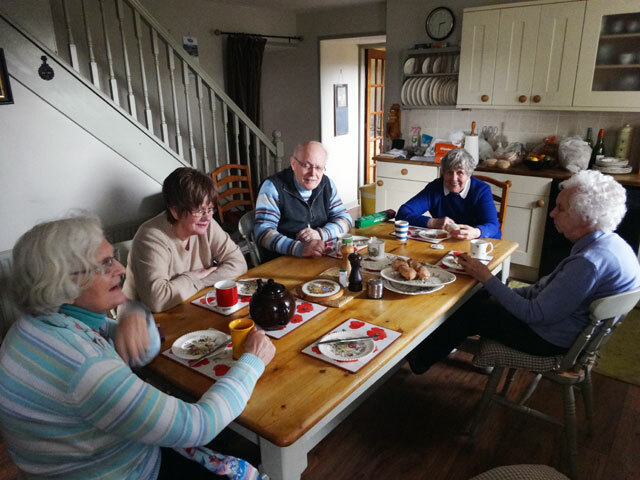 We breakfasted before nine – almost everyone had porridge – and then we were about to set off for Berwick when Tom and Dorothy arrived. I had tried to phone them earlier but evidently I had also phoned them by mistake and Tom had been whistling down my phone trying to catch my attention. I had mentioned to Morag that I thought I had heard someone whistling and calling to me but she told me that it was probably the birds which were in full morning chorus! 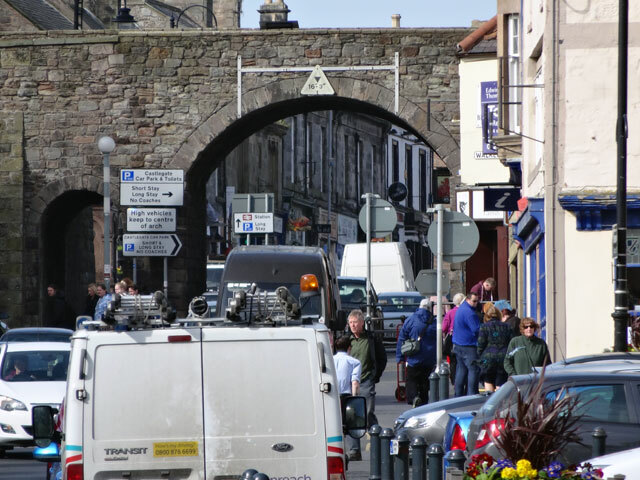 After lots of catching up, we set off for Berwick where we walked around the town walls before journeying back along the ramparts. It was windy and at least one poor gentleman had his hat blown clean off his head. 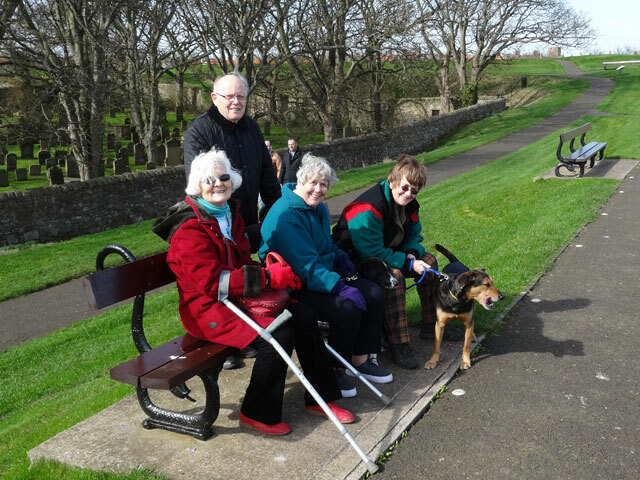 We explored Berwick and bought rolls to have with bacon for lunch when we returned to Mount Pleasant. Bill and I returned via Duns so that we could buy a steak pie for dinner. Back home we dined on bacon rolls (and caramel doughnuts and yum-yums which we had also bought). 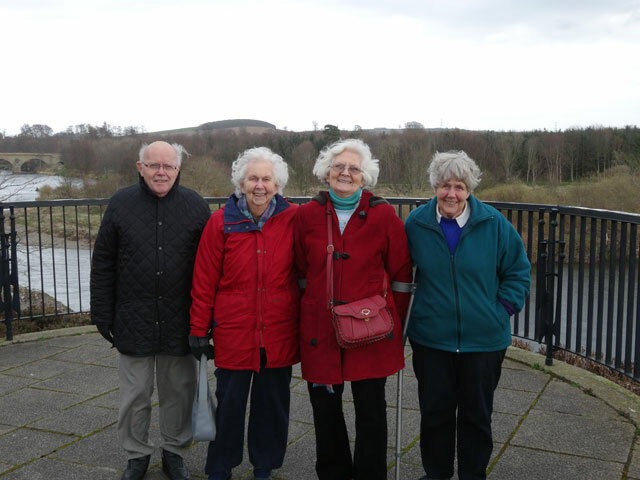 In the afternoon Mum joined Morag, Cathy Bill and me as we drove to Coldstream. I learned that the figure on the pillar in the town is Charles Marjoriebanks who was a landowner, an MP and a generally good egg who treated his tenants benevolently (all of this told to us by the proprietor of the chemist in the town). We walked through the Henderson Park which is beautifully kept and which contains memorials of the activities of the Coldstream Guards (which, of course, were raised from here by general Monk). We then visited the little shop which contains a world war two museum and has many items of memorabilia for sale. I went off to collect Olive from Berwick (my third foray into England today) and when we returned we joined everyone else for a late coffee before bed. Today was budget day and it appears that I am in the group of people who have been smiled on by the chancellor. Flexibility with my pensions, increased personal allowance, special savings bonds for older people. I don’t yet know all of the details, nor what has been done to help other more deserving groups and business. I shall look forward to discovering all of that tomorrow. It is ferociously windy and the final walk with the dogs was treacherous. Rachel and Rowan spent ages collecting all of the rubbish from the farmhouse bin as it had been blown over and distributed down the road towards Sinclairshill. It was good to get to bed at the end of a happy day.